Wherever you are in the world\ we're always there. 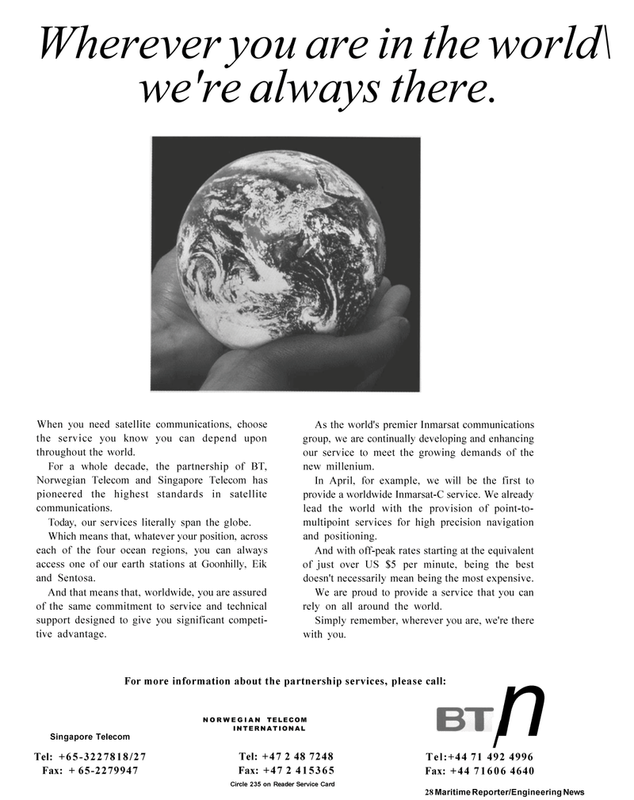 When you need satellite communications, choose the service you know you can depend upon throughout the world. Norwegian Telecom and Singapore Telecom has pioneered the highest standards in satellite communications. Today, our services literally span the globe. Which means that, whatever your position, across each of the four ocean regions, you can always access one of our earth stations at Goonhilly, Eik and Sentosa. And that means that, worldwide, you are assured of the same commitment to service and technical support designed to give you significant competi- tive advantage. As the world's premier Inmarsat communications group, we are continually developing and enhancing our service to meet the growing demands of the new millenium. In April, for example, we will be the first to provide a worldwide Inmarsat-C service. We already lead the world with the provision of point-to- multipoint services for high precision navigation and positioning. And with off-peak rates starting at the equivalent of just over US $5 per minute, being the best doesn't necessarily mean being the most expensive. We are proud to provide a service that you can rely on all around the world. Simply remember, wherever you are, we're there with you.